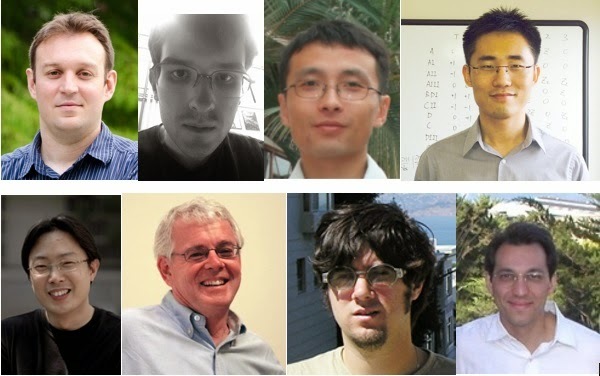 From Left to Right: (top row) Stevan Nadj-Perge, Ilya K. Drozdov, Jian Li, Hua Chen ; (bottom row) Sangjun Jeon, Allan H. MacDonald, B. Andrei Bernevig, Ali Yazdani. Authors: Stevan Nadj-Perge1, Ilya K. Drozdov1, Jian Li1, Hua Chen2, Sangjun Jeon1, Jungpil Seo1, Allan H. MacDonald2, B. Andrei Bernevig1, Ali Yazdani1. 1Joseph Henry Laboratories and Dept of Physics, Princeton University, USA. 2Department of Physics, University of Texas at Austin, USA. In 1937 Italian scientist Ettore Majorana, one of the most promising theoretical physicists at that time, proposed a hypothetical fermionic excitation, now called Majorana fermion, which has a property that it is its own anti-particle . Ever since significant efforts were invested in finding an elementary particle described by Majorana. While present for many years in particle physics community, it was only in 2001 that Alexei Kitaev suggested an intriguing possibility that a type of a quasi-particle, a condensed matter analog of the Majorana fermion could exist . Such quasi-particle would emerge as a zero energy excitation localized at the boundary of a one dimensional topological superconductor. Following his seminal work various systems were proposed as a potential platform for realization of Majorana quasi-particles. Apart from fundamental scientific interest, the motivation for investigating Majorana bound states partly relies on their potential for use for quantum computing [3,4]. August 25, 2013: "Visualizing Nodal Heavy Fermion Superconductivity"
by Brian Zhou, Shashank Misra, and Ali Yazdani. Previous to our experiments, the most promising experimental route to realize these elusive bound states was based on semiconductor-superconductor interfaces in which Majorana fermions would appear as conductance peaks at zero energy [5,6]. Indeed experiments in 2012 reported zero energy conductance peaks suggesting presence of Majorana modes in these type of systems [7,8], however, alternative explanations related to disorder and Kondo phenomena proposed latter could not be fully ruled out. It is worth noting that in these interfaces spatial information about localized excitations is very hard to obtain. Fig. 1: (A) Schematic of the proposal for realization and detection of Majorana states: A ferromagnetic atomic chain is placed on the surface of strongly spin-orbit–coupled superconductor and studied using STM. (B) Band structure of a linear suspended Fe chain before introducing spin-orbit coupling or superconductivity. The majority spin-up (red) and minority spin-down (blue) d-bands labeled by azimuthal angular momentum m are split by the exchange interaction J (degeneracy of each band is noted by the number of arrows). a, interatomic distance. (C) Regimes for trivial and topological superconducting phases are identified for the band structure shown in (B) as a function of exchange interaction in presence of SO coupling. The value J for Fe chains based on density functional calculations is noted. μ is the chemical potential. Building upon previous proposal to realize Majorana modes in an array of magnetic nanoparticles , we proposed to use a chain of magnetic atoms coupled to a superconductor . The key advantage of this platform is that the experimentally properties of this system can easily be studied using standard scanning tunneling microscopy (STM) technique. While ours and other follow-up initial proposals [11-16] consider specific orientation of the magnetic moments, the approach works also for ferromagnetic atomic chains as long as it is coupled to a superconductor with strong spin-orbit coupling (Fig. 1A) . In this case, the large exchange interaction results in a band structure of the chains such that majority spin band is fully occupied while the Fermi level is in the minority spin bands. For example the electronic structure of a linear Iron (Fe) ferromagnetic atomic chain is shown in Fig. 1B. Considering only d-orbitals which are spin-polarized it is easy to show that many of the bandstructure degeneracies are lifted and that for large range of parameters, chemical potential and the exchange energy, such chains are in topologically non-trivial regime characterized by the odd number of crossing at the Fermi level (Fig 1C). When placed on the superconducting substrate with strong-spin orbit coupling the resulting superconductivity on the chain will necessarily be topological in nature resulting in zero energy Majorana bound states located at the chain ends. Fig. 2: (A) Topograph of the Pb(110) surface after growth of Fe, showing Fe islands and chains indicated by white arrows and atomically clean terraces of Pb (regions with the same color) with size exceeding 1000 Å. (Lower-right inset) Anisotropic atomic structure of the Pb(110) surface (Upper-left insets) images of several atomic Fe chains and the islands from which they grow (scale bars, 50 Å). (B) Topography of the chain colorized by the conductance at H= ±1 T from low (dark blue) to high conductance (dark red). (C) Difference between conductance on and off the chain showing hysteresis behavior. (D and E) Atomic structure of the zigzag chain, as calculated using density functional theory. The Fe chain structure that has the lowest energy in the calculations matches the structural features in the STM measurements, aB is the Bohr radius. We have developed a way to grow iron atomic chains on the surface of lead (Pb) which, due to heavy atomic mass, is expected to have strong spin-orbit coupling. For this purpose we used Pb(110) crystallographic surface orientation which has characteristic anisotropy (Fig. 2(A) lower left inset). When a sub-monolayer of Fe is evaporated and slight annealing, the anisotropy of the substrate could trigger growth of one-dimensional atomic chains. We investigated the resulting structures by using STM at cryogenic temperatures (temperature was 1.4K in the experiment). On relatively large atomically ordered regions of the Pb(110) surface we observed self-assembled islands as well as single atom wide chains of Fe. Depending on growth conditions, we find Fe chains as long as 500 Å with ordered regions approaching 200 Å. In order to confirm ferromagnetic order on the chain we have performed spin-polarized measurements using bulk antiferromagnetic Chromium STM tips. Tunneling conductance (dI/dV) at a low bias voltage as a function of the out-of-plane magnetic field shows contrast for opposite fields (Fig. 2B) and a hysteresis behavior (Fig. 2C, note that no hysteresis is observed on the Pb substrate). The observed hysteresis loop corresponds to the tunneling of electrons between two magnets with the field switching only one of them at around 0.25 T.
We also observed the variation of the spin-polarized STM signal along the chain which is likely due to its electronic and structural properties. Indeed, both topographic features and periodicity of signal variation could be very well explained by our theory collaborators who performed density functional theory modeling. Their calculations suggested that our chains have zig-zag structure which explains both topographic information obtained using STM and matches well with our spin-polarized measurements (Fig. 2D and 2E). Fig. 3: (A) STM spectra measured on the atomic chain at locations corresponding to those indicated in (B) and (C). For clarity, the spectra are offset by 100 nS. The red spectrum shows the zero-bias peak at one end of the chain. The gray trace measured on the Pb substrate can be fitted using thermally broadened BCS superconducting density of states (dashed gray line, fit parameters Δs = 1.36 meV, T = 1.45 K). (B and C) Zoom-in topography of the upper (B) and lower end (C) of the chain and corresponding locations for spectra marked (1 to 7). Scale bars, 25 Å. (D and E) Spectra measured at marked locations, as in (B) and (C). 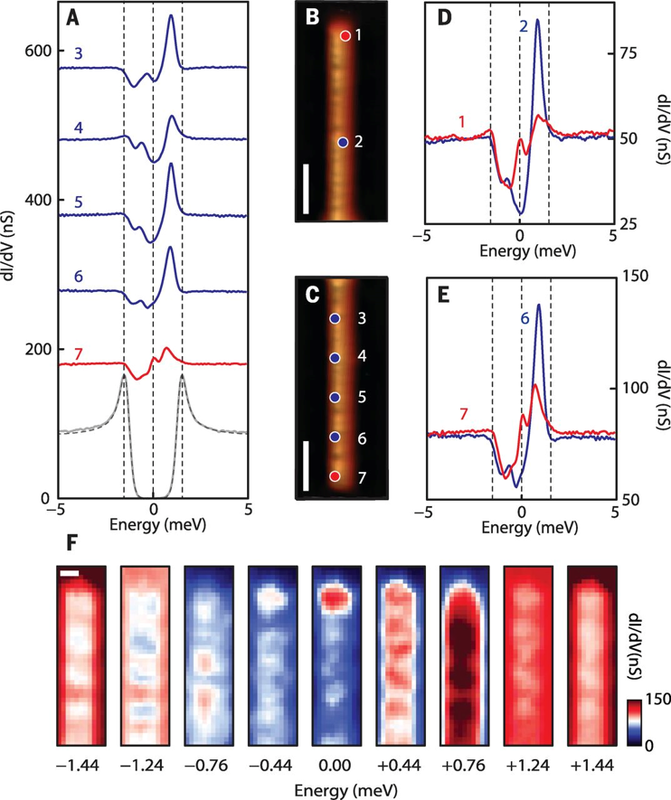 (F) Spatial and energy-resolved conductance maps of another atomic chain close to its end, which shows similar features in point spectra as in (A). The conductance map at zero bias (middle panel) shows increased conductance close to the end of the chain. Scale bar, 10 Å. After establishing basic properties of our chains we investigated low-energy excitations using spatial spectroscopic mapping, see Fig 3. While on the surface of bare Pb(110), there is clear structure of the superconducting gap on the Fe atomic chain, the presence of the in-gap states is predominant (Fig. 3A). Most notably a peak close to zero bias voltage is observed near the chain end together with asymmetric less-developed gap-like structure in the middle of the chain (Fig. 3D and Fig. 3E). Both spatially resolved spectra and the spectroscopic maps at low bias voltage show signatures expected from Majorana bound states (Fig. 3F). The ability to correlate the location of the zero bias conductance peak with the end of the atomic chains is one of the main experimental results of our work. This is one of the basic requirements for interpreting that this feature is associated with the predicted Majorana bound state of a topological superconductor. In addition to robust observation of the zero bias peaks in many chains, we have performed several control experiments to eliminate other potential effects which may give similar looking signatures. For example, when superconductivity is suppressed by applying small magnetic field, the spectrum on the chain becomes featureless in contrast to what would be expected for Kondo effect. Also for very short chains zero biased peaks were not observed, ruling out trivial effects related to the chain ends. Furthermore, in order to increase experimental resolution we took measurements with superconducting tip which also confirm the over picture consistent with Majorana bound states in this system. The observed spectroscopic signatures are consistent with the existence of Majorana bound states in our system. An obvious extension of our experiments is to create two dimensional islands and search for propagating Majorana modes or, for example, investigate other systems with both even and odd number of band crossing at Fermi level in order to further test the concept behind our study. Ultimately the future experiments will focus on manipulation of Majorana bound states in this system . Ettore Majorana, "Teoria simmetrica dell’elettrone e del positrone", Il Nuovo Cimento, 171 (1937). Abstract. A. Yu. Kitaev, "Unpaired Majorana fermions in quantum wires". Physics Uspekhi, 44, 131 (2001). Full Article. A. Yu. Kitaev, "Fault-tolerant quantum computation by anyons". Annals of Physics. 303, 2 (2003). Abstract. Jason Alicea, Yuval Oreg, Gil Refael, Felix von Oppen, Matthew P. A. Fisher, "Non-Abelian statistics and topological quantum information processing in 1D wire networks". Nature Physics, 7, 412 (2011). Abstract. Yuval Oreg, Gil Refael, and Felix von Oppen, "Helical Liquids and Majorana Bound States in Quantum Wires", Physical Review Letters, 105, 177002 (2010). Abstract. Roman M. Lutchyn, Jay D. Sau, S. Das Sarma, "Majorana Fermions and a Topological Phase Transition in Semiconductor-Superconductor Heterostructures". Physical Review Letters, 105, 077001 (2010). Abstract. V. Mourik, K. Zuo, S.M. Frolov, S.R. Plissard, E.P.A.M. Bakkers, L.P. Kouwenhoven, "Signatures of Majorana fermions in hybrid superconductor-semiconductor nanowire devices", Science 336, 1003 (2012). Abstract. 2Physics Article. 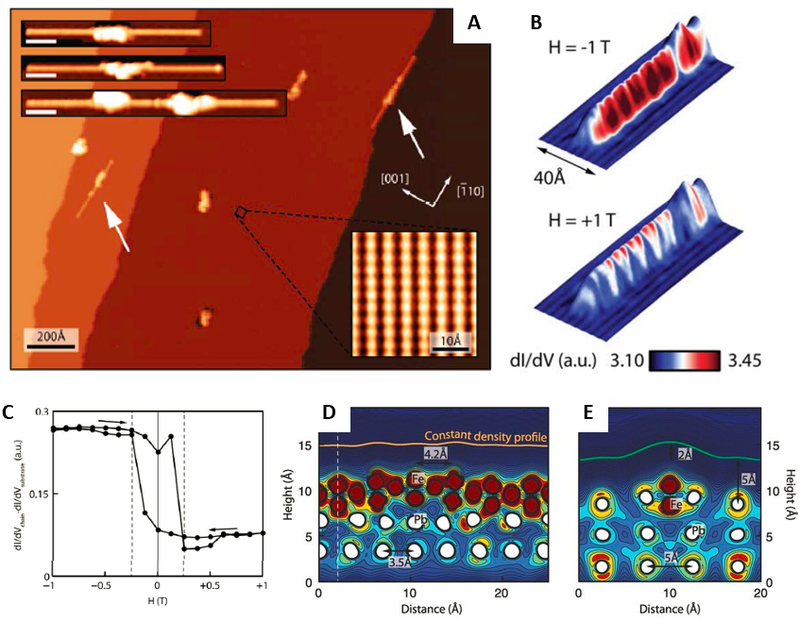 Anindya Das, Yuval Ronen, Yonatan Most, Yuval Oreg, Moty Heiblum, Hadas Shtrikman, "Zero-bias peaks and splitting in an Al-InAs nanowire topological superconductor as a signature of Majorana fermions". Nature Physics, 8, 887 (2012). Abstract. 2Physics Article. T. P. Choy, J. M. Edge, A. R. Akhmerov, C. W. J. Beenakker, "Majorana fermions emerging from magnetic nanoparticles on a superconductor without spin-orbit coupling". Physical Review B, 84, 195442 (2011). Abstract. S. Nadj-Perge, I. K. Drozdov, B. A. Bernevig, Ali Yazdani, "Proposal for realizing Majorana fermions in chains of magnetic atoms on a superconductor". Physical Review B, 88, 020407 (2013). Abstract. Falko Pientka, Leonid I. Glazman, Felix von Oppen, "Topological superconducting phase in helical Shiba chains". Physical Review B, 88, 155420 (2013). Abstract. Jelena Klinovaja, Peter Stano, Ali Yazdani, Daniel Loss, "Topological Superconductivity and Majorana Fermions in RKKY Systems". Physical Review Letters, 111, 186805 (2013). Abstract. Bernd Braunecker, Pascal Simon, "Interplay between Classical Magnetic Moments and Superconductivity in Quantum One-Dimensional Conductors: Toward a Self-Sustained Topological Majorana Phase". Physical Review Letters, 111, 147202 (2013). Abstract. M. M. Vazifeh, M. Franz, "Self-Organized Topological State with Majorana Fermions". Physical Review Letters, 111, 206802 (2013). Abstract. Sho Nakosai, Yukio Tanaka, Naoto Nagaosa, "Two-dimensional superconducting states with magnetic moments on a conventional superconductor". Physical Review B, 88, 180503 (2013). Abstract. Younghyun Kim, Meng Cheng, Bela Bauer, Roman M. Lutchyn, S. Das Sarma, "Helical order in one-dimensional magnetic atom chains and possible emergence of Majorana bound states". Physical Review B, 90, 060401 (2014). Abstract. Stevan Nadj-Perge, Ilya K. Drozdov, Jian Li, Hua Chen, Sangjun Jeon, Jungpil Seo, Allan H. MacDonald, B. Andrei Bernevig, Ali Yazdani, "Observation of Majorana fermions in ferromagnetic atomic chains on a superconductor". Science 346, 602-607 (2014). Abstract. Jian Li, Titus Neupert, B. Andrei Bernevig, Ali Yazdani, "Majorana zero modes on a necklace". arXiv:1404.4058 [cond-mat] (2014).